Pioneering fast-casual poke brandPokéworks opened in Union Square this week. Rapidly growing to 15 locations this year, the brands third NYC location will open near Grand Central next month. 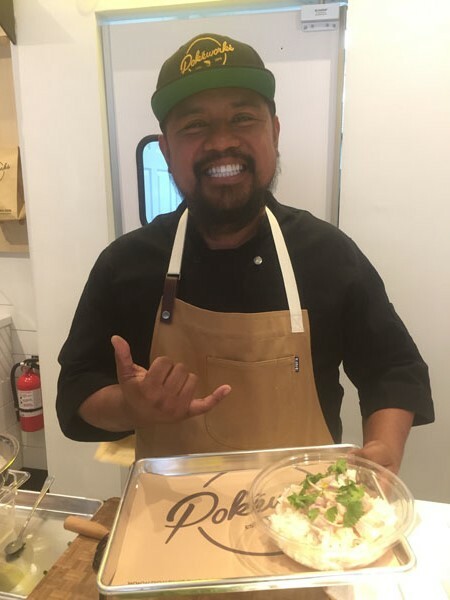 In conjunction with the openings, the brand also announced a new collaboration with Hawaii-basedchef Sheldon Simeon welcoming the first Sustainable Series menu offering: theCoco Bora bowl. Inspired by Sheldon’s Filipino background and Pokéworks dedication to offering underutilized sustainable fish varieties, Bora (a light and mild white fish) is mixed with ginger, red onions, Thai chili, a Kinilaw sauce (coconut vinegar, coconut milk, black pepper, lime juice), and more. Founded in 2015, Pokéworks was created out of our founders who shared a vision of bringing people flavorful. After many trips to Hawaii filled with lots of poké, the founders decided to bring this island favorite to the Mainland for all to enjoy. Now bringing an authentic taste of the islands to Pokéworks is our newest chef-collaborator, Sheldon Simeon. Sheldon is an alumnus of Bravo’s Top Chef and the executive chef/owner of Maui’s Tin Roof. He has crafted a series of Signature Works for Pokéworks with ingredients that draw inspiration from the mix of cultures he grew up with in Hawaii. Inspired by sustainable, seasonal, and natural ingredients, Pokéworks is committed to bringing you superior seafood. We view responsibly-sourced seafood as more than just a trend. We believe in the importance of meeting today’s needs while preserving our oceans so that future generations will never have to fish in troubled waters. At Pokéworks, our sustainability efforts go beyond the menu. Being socially and environmentally responsible is a commitment. On top of prioritizing sustainable food sources, we have put an effort into finding sustainable building material. A number of our spaces use Forest Stewardship Council™-certified reclaimed wood products. ‘Poke Your Way’ will be coming to a location near you. Pokéworks has plans to expand throughout North America and worldwide. We have many franchise opportunities for experienced restaurateurs that want to join our team. Pokeworks will be the destination for fresh, fast, and reliable food.